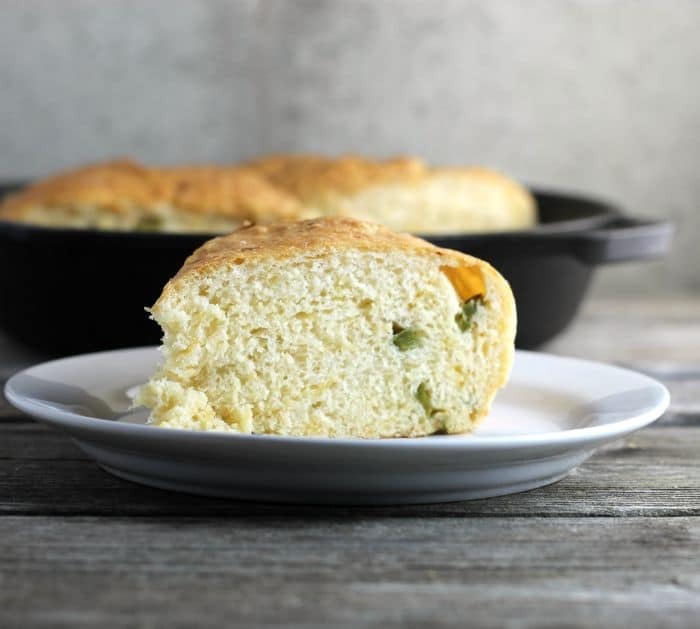 Jalapeno cheddar bread is a great side to go with a bowl of soup, a bowl of chili, or well whatever you would like it to go with. When I was a kid bread was served with every meal and when I say bread it was bread that was made from scratch, nothing that was bought in a store. At breakfast, there was homemade bread toasted. For lunch, we had sandwiches made with homemade bread in our school lunch boxes. For dinner, there was homemade bread with butter. I think you get my point. I started making bread when I was in my teens. As you can see bread has been a part of my whole life. It is a tradition that I try to keep going. Not that I serve bread at every meal, but I do love making bread from scratch. The bread that I make is not always the white traditional bread that my mom made way back when I was a kid. Yeah, sometimes I like to experiment and switch things up a bit. 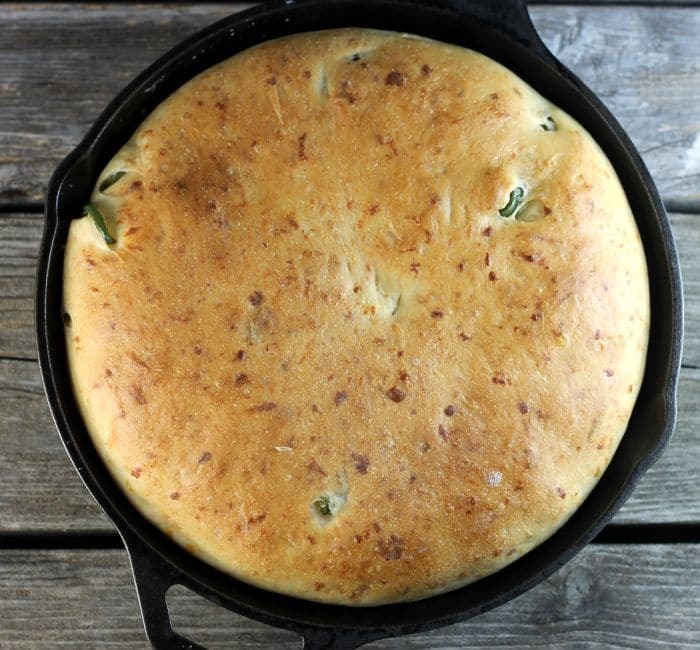 Like this jalapeno cheddar bread, with one of my favorite cheeses and a bit of a kick with the jalapeno pepper. It goes perfectly with a bowl of soup or a bowl of chili. I have served it with soup, but I have served it as a side with meatloaf or fried chicken. No matter what is on the menu this is a great bread to serve. Just remember that if you would like a bread with less heat to use fewer jalapeno peppers or add a few more if you crave foods with a lot of heat. In a large bowl combine the 1 cup of flour, yeast, sugar, and salt. Heat the water to 120 to 130 degrees F. Add the heated water and olive oil to the flour mixture mix in until well blended. Add the cheddar cheese and sliced jalapenos and stir in. Continue to add the flour, mixing by hand until the dough is just slightly sticky. Knead the dough until smooth. Cover and let rise for about 1 hour or until the dough has doubled in size. Grease a 10-inch cast iron skillet or a baking sheet. Once the dough is done rising form into an 8-inch disk. Place in the prepared skillet or baking dish. Let rest for 1/2 hour. Preheat oven to 375 degrees F. Place the bread into the preheated oven after resting for 1/2 hour. Bake for about 20 minutes or golden brown. Remove from the oven and set on cooling rack. Serve right out of the oven or cool. 1. If a large enough bowl is used for the dough it can be kneaded in the bowl. Now all I need is a bowl of steaming hot soup for a comforting and delicious meal! There’s nothing better than homemade yeast bread! Love your add-ins—I’d love a big wedge with a bowl of chili!!! 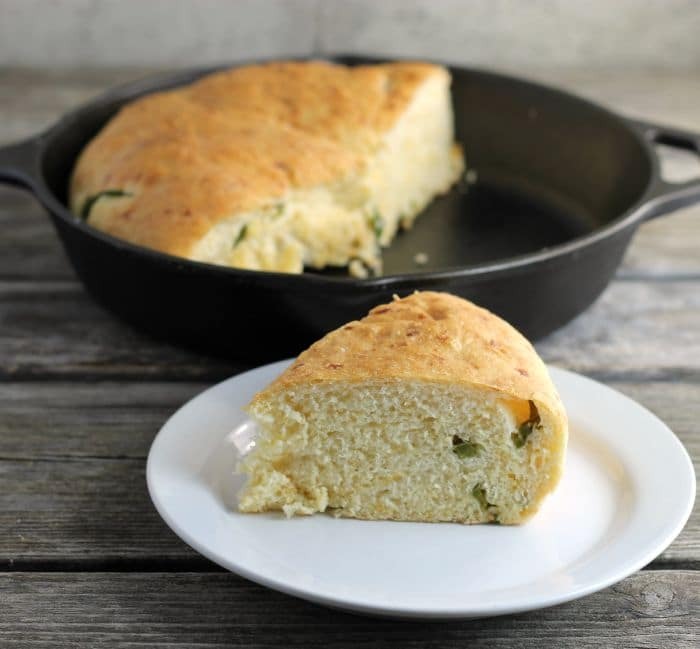 Love me some skillet bread! Happy Weekend! I am so jealous that you grew up with fresh, homemade bread at every meal! Maybe that will be my mission for Robbie. 🙂 After all, I love baking bread (and eating it), so this sounds like a great goal. 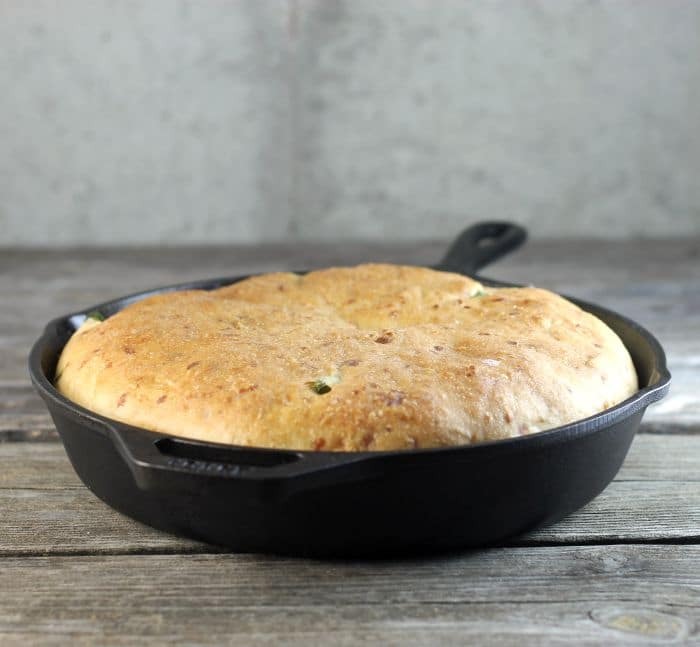 And Jalapeno Cheddar Bread is a great combo of flavors, too! Sounds like you have some wonderful memories of your childhood. This bread looks wonderful, love how you spiced it up. Mmmm, this looks wonderful. Love jalapenos — can never get enough. Good stuff — thanks. You were lucky to have grown up with a mom that made homemade bread everyday…that is wonderful. Your cheese and jalapeño bread sounds terrific.